Community Well Water Treatment Systems Greater Seattle, Greater Portland and Alaska. Washington Department of Health (WA DOH) regulates community water systems to ensure the levels of arsenic, bacteria, iron, manganese, etc. are within acceptable levels. If your community well water does not meet Washington Department of Health requirements it may lead to fines or undesirable regulatory action against your community. Now, it's cost effective for your community to have a WA DOH compliant water system. Our specialty is removing the culprits behind poor quality well water in western Washington: bacteria, iron, arsenic, manganese, and sulfur and bringing community water systems into compliance with WA DOH drinking water regulations. We have successfully designed, installed, and maintained numerous community water filtration system installations in the Pacific Northwest. We work with home owner associations, churches, camps, bed & breakfasts, hotels, and more. You can sit back and relax while we test, pilot test, design, install, and launch your new water treatment and filtration system. Filter replacement and system maintenance are just a phone call away. Routine filter changes and maintenance will keep your water delicious, ensure it is WA DOH compliant, and maximize the life of your community water treatment equipment. We make it easy for your community to enjoy delicious water that is friendly to your water-using appliances, plumbing, and the environment. Our proven-successful process ensures your community water system will cost-effectively address your well water's unique water quality issues. We eliminate costly and time-consuming guesswork. Conduct an on-site well inspection, preliminary water analysis and evaluation using field test equipment, and consult with the person(s) in charge of your community water system monitoring. At an agreed upon price, perform a pilot study with various filtration media to trial test and determine the best and most cost effective treatment process for your specific water quality problems. Create CAD drawings for a preliminary design in collaboration with one of the few licensed professional engineers (PE) that knows water treatment and works with WA DOH. We submit your stamped design to WA DOH for their review and approval. The engineering fees for this submittal are included in your pilot study fee, above. Note: WA DOH fees are not included in our quotes. a)	Engineers quote to complete your system drawings and submit to WA DOH. b)	System quote: including professional installation, high-quality equipment, filtration, plumbing, parts, materials, system start-up, verification, and training. Note: WA DOH fees are not included in our quotes. Those fees are determined by WA DOH and paid by your community directly to WA DOH. On your approval of both quotes we will schedule your water treatment system installation. Install and verify your system then train your representative to perform routine maintenance. We are dedicated to your community residents having delicious, high quality water in their homes. With the purchase a complete water treatment system your satisfaction is guaranteed! Not only is it a legal responsibility for a community to provide water which meets WA DOH standards, your water treatment and filtration system makes your property easier to market and increases its sale value. 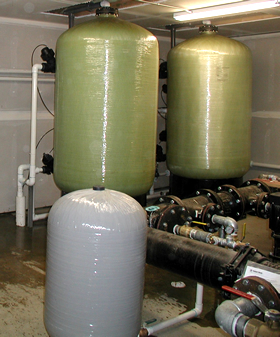 Request a water analysis or contact us to answer your questions about a community well water treatment system. Service Area: western Washington including Auburn, Black Diamond, Bonney Lake, Buckley, Covington, Eatonville, Enumclaw, Fall City, Fife, Gig Harbor, Graham, Issaquah, Kent, Lake Tapps, Maple Valley, Orting, Preston, Puyallup, Renton, Roy, Spanaway, Sumner, Wilkeson, Yelm, and surrounding areas. • Control Valves: 1.5" and 2"